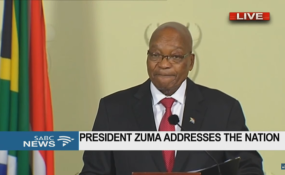 President Jacob Zuma addresses the nation via live television broadcast after his party the African National Congress recalled him (file photo). While former president Jacob Zuma delivered a speech to students in the Eastern Cape questioning the existence of state capture, the National Assembly approved a pension increase for him. The motion, tabled on Wednesday by ANC chief whip Jackson Mthembu, contained the Independent Commission for the Remuneration of Public Office Bearers' recommendation. In line with the Remuneration Act, it recommends that Zuma is paid a "taxable pension benefit" of 100% of his salary and benefits payable to him on the day prior to his retirement. The commission further recommended that "the increase to the benefit should be linked to the increase in the sitting president's salary". When Zuma resigned as president, he was earning more than R2.9m a year. In the budget, then finance minister Malusi Gigaba tabled in February, R3.6m was set aside for President Cyril Ramaphosa's salary this year. Furthermore, upon Zuma's death, his "widow or widows, dependent or nominee, including his estate" will receive 50% of his pension as at the time of his death. The state will also pay his medical fund. The DA, EFF and FF Plus did not support the motion. "We have paid enough for Mr Zuma already," DA chief whip John Steenhuisen said. He added that South African citizens have paid enough for Zuma by footing his legal bill and that the estimated R100bn that state capture has cost the country was payment enough. "This is a constitutional delinquent that compromised Parliament!" Steenhuisen said. "Why would we reward this man with an increase in salary and pension?" He said the commission only made a recommendation to the National Assembly, which could use its discretion in not passing it. EFF MP Sam Matiase said: "Mr Zuma does not deserve to be called a head of state. He's the former head-looter of state." "We can't with a clear conscience agree to pay that man a salary until the day he pays for his sins." Matiase said Zuma didn't leave voluntarily. He left because he would have been impeached, in which case he would have lost his benefits. FF Plus MP Corné Mulder recalled how he, a few years ago, suggested that Zuma's salary be adjusted to R1 per year. He said he stood by this. "When are you going to stand up and do what is right?" he said in the direction of the ANC benches. COPE leader Mosiuoa Lekota also opposed the motion, as "the individual" was found by the Constitutional Court to have violated the Constitution and his oath of office. IFP MP Narend Singh "respectfully disagreed" with the other opposition parties. "Sooner or later, all of us will become pensioners," he said. He added that administrators from before 1994 still collected pensions from the taxpayers. "If found guilty, then he must pay back the money," Singh said. "Don't play the man, play the ball. Look at the office of the president." House chairperson Thoko Didiza, on behalf of the ANC, said MPs shouldn't be selective when dealing with the matter. "The Constitutional Court also ruled on Parliament, not the governing party," she said. She said he survived several motions of no confidence. The motion was passed with 197 votes in favour, 95 opposing and no abstentions.